Home » 3RD ANNUAL BANQUET AND AUCTION! Live Auction, Silent Auction, Raffles, Games and Dinner! Enjoy a delicious service dinner and play fun games to win desirable guns and other prizes. 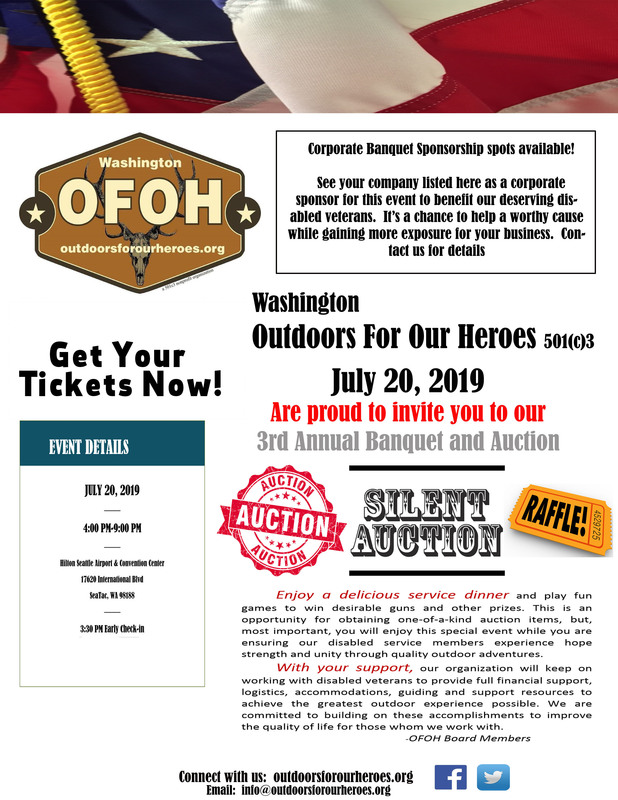 This is an opportunity for obtaining one-of-a-kind auction items, but, most important, you will enjoy this special event while you are ensuring our disabled service members experience hope strength and unity through quality outdoor adventures. Purchase a corporate sponsor for this event to benefit our deserving disabled veterans. Your company will be featured on this page, as well as prominently as a Corporate Sponsor throughout the year on OFOH’s website, with a link to your company website and social media pages. Your logo will be displayed prominently at our annual fundraiser event in various ways based upon your level of sponsorship. It’s a chance to help a worthy cause while gaining more exposure for your business! Corporate Table- Service Dinner for 10 comes with gifts for guests, and a firearm to raffled among your table . ****NEW THIS YEAR****- OFOH has acquired 23, brand new in the box, ALL DIFFERENT firearms to be given away at the corporate tables! Here’s how it works: Whoever books the 1st Corporate Table gets 1st choice of the firearms on the list, to be raffled at their table among the 10 attendees at their table. Whoever books the 2nd Corporate Table gets 1st choice of the remaining firearms, to be raffled at their table; and so on, until all of the firearms are spoken for! Get in early for the best choice! The Hilton is offering our banquet attendees a special room rate for the night of the banquet. There are a limited block of rooms set aside at a discounted rate so you will want to reserve your room ASAP. Reservations must be made by 6-28 (if not sold out sooner). To make a reservation you can call 1-800-HILTONS or CLICK HERE and use the coupon code “OUT” when booking the room. We are excited to see you at the banquet on July 20th! See you then.